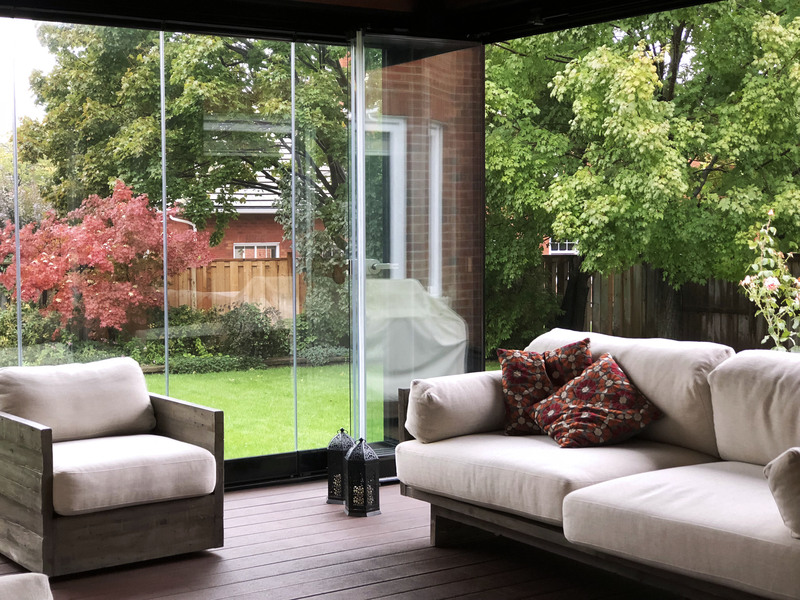 Enclose your porch or patio with retractable glass walls that you can enjoy as an open and closed space as you please. Protect yourself when the summer sun gets a little too hot – without losing any natural light! Custom made elegant shades designed to measure, designed for you. Spend more time outdoors in comfort and style with our frameless retractable glass walls, balcony glass enclosures, sunrooms and patios. Get protection from wind, rain, UV rays and pests with retractable glass that’s easy to use, low maintenance and beautiful! Our sunrooms are available in Langley, BC, Toronto, ON and across Canada! Our retractable glass walls are strong, easy to maintain and simple enough for a child to use. Transforming your outdoor space into a year-round place for relaxing and entertaining couldn’t be easier. Don’t let curious neighbours discourage you from using your outdoor patio or condo balcony. Our customized screens and blinds work perfectly with our glass walls and sunrooms to create a private and soothing retreat from the outside world. Where security is a concern, our retractable glass walls add an extra layer of protection. Just as importantly, they can be locked to keep children and pets secure. We have now had our window glass enclosure installed for several months. We've had some strong winds, measured up to 100 km/h. On windy days, we keep the glass windows shut and we can still be on the balcony, as if it was a calm day. That is wonderful. Sure, we can hear the wind blowing, but we are outside in comfort. We love our glass enclosures. Balcony glass allows us to enjoy that extra bit of space we always need around the home. Discover new ways you can convert your balcony into a space where you can have control over the four season. Create a special area in your home that you can enjoy whenever you wish. We don't want you to pack up your backyard for the seasons. Get creative, get inspired. Lumon patio covers are a great way to extend the patio season by weeks and months. Learn more about our elegant frameless balcony and terrace glass systems. The stylish balcony facades and our screens and blinds, designed to work seamlessly with our glass products. Bring the outdoors in to enjoy as a tranquil oasis, entertainment area and even a workspace. It's like 'California room' for us, more than half of our life is spent in here. We do all our planning and our dreaming out here. I don’t think we’ve been downstairs to our music room ever since we had this finished. Read how this couple transformed their backyard into their dream paradise. Transforming your home to expand and beautify your outdoors is an exciting process. Browse our photo gallery to gather ideas and inspirations for our custom sunrooms, balcony and patio cover projects! Discover versatile and profitable applications for condo developments, restaurants, and more. Interested in joining our team? Lumon Canada is always looking for talent like yours join our profitable and growing company. Check out our current job openings and apply today!